Omar de Frias' dreams of producing his own premium cigars came true in 2013 with the launch of Fratello Cigar Company. 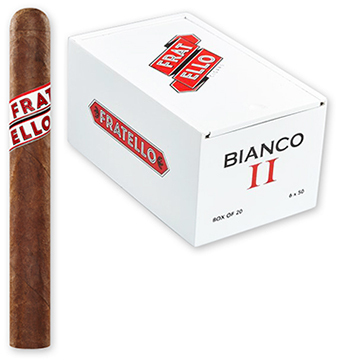 The boutique company's first line of cigars, Fratello, was a tremendous hit. Omar traveled from one cigar shop to the next selling his Fratello cigars and is now represented in over 500 shops across the country. Milan Tobacconists is honored to be among the first he visited. With an ever-growing fan base and acknowledged as a force in the cigar industry, he set his sights on a second line ~ Fratello Bianco. With Fratello Bianco, Omar created something richer, darker, and a little fuller-bodied than the original Fratello. A gorgeous, toothy San Andres Maduro wrapper provides a sweetness that compliments the spicy Nicaraguan, sweet Peruvian, and bold Pennsylvania Broadleaf Ligero filler tobaccos and Dominican binder. Beautifully constructed at an undisclosed location in Esteli, Nicaragua, the Bianco shares an abundance of perfectly balanced flavors, including notes of espresso, wood, earth, black pepper, dark cocoa, and the wrapper leaf's raisin sweetness.